Featuring a number of informed inside perspectives from artists, curators, critics and gallery and museum professionals, What’s Next will provide insight and reflection on ways in which artists might navigate the complex and often contradictory values and processes that surround the making, distribution and value formation of contemporary art. What’s Next will be delivered through a series of themed public panel discussions, comprising a variety of expert perspectives, which will be followed by seminars, workshops or tutorials, as appropriate. As well as providing practical support and advice for artists at various stages of their careers, the series will also offer critical and creative reflections on the forces that govern and dictate the way in which art circulates and the manner in which artists might in turn facilitate and sometimes block these processes. While principally targeted at final year MA Fine Art students at the RCA, What’s Next will also generate a resource for artists and students from beyond the RCA. What’s Next has been developed in collaboration between the RCA School of Fine Art and DACS. Each Panel will be assigned a lead who will develop the theme and programming around it in consultation with RCA and DACS. Sonya Dyer is an artist, writer and occasional curator from London. Her research-based, post-medium practice utilises dialogical platforms, reproductive technologies and moving image. Dyer is concerned with modes of social organisation, the inter disciplinary and the performative, exploring how subjectivities and alliances are formed, particularly across cultures and temporalities. Her practice currently manifests itself through the …And Beyond Institute for Future Research, a peripatetic think tank concerned with the creation of possible futures. Recent projects include The Claudia Jones Space Station (BALTIC Centre for Contemporary Art and The NewBridge Project, Newcastle), Into the Future (Primary, Nottingham), At the Intersections (Nottingham Contemporary), Platform: In the Making and The Paul Robeson Research Station, (both Site Gallery, Sheffield). Previously Curator, Public Programmes at Tate Modern and Tate Britain, Dyer has previously developed projects at galleries and museums including The Tetley (Leeds) and The Queens House (Royal Maritime London) and has contributed to numerous publications including Frieze, Contemporary &, a-n online and Petunia. Dyer is a previous artsadmin Artist Bursary Scheme recipient, and was a 2011-12 Whitney Museum of American Art: Independent Study Program Fellow. She is currently a PhD candidate at Middlesex University. Catherine Wood is Senior Curator, International Art, specialising in performance. She works on performance projects, exhibitions, collection acquisitions and displays at Tate Modern, as well as being actively engaged in research. Catherine was instrumental in founding the performance programme at Tate in 2002 and since then has programmed more than two hundred live works by artists including Mark Leckey, Tania Bruguera, Trisha Brown, Katerina Šedá, Boris Charmatz, Ei Arakawa and others, both at Tate and within the online space Performance Room that she initiated in 2011. In the exhibition A Bigger Splash: Painting after Performance that she curated in 2012, Catherine Wood traced a dynamic relationship between painting and performance emerging in the post-1945 period, working back from contemporary artists’ perspectives. As a contributor to the International Monitoring Group specialising in strategies for collecting performance art, Catherine Wood has worked on acquisitions of works by artists including by Joan Jonas, Tino Sehgal and Suzanne Lacy. 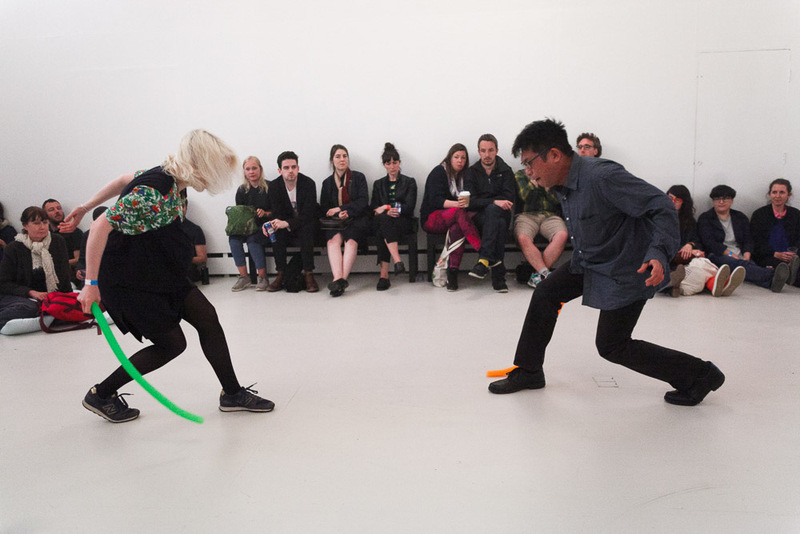 She curated Yvonne Rainer: Dance Works at Raven Row in 2014, and with Andrea Lissoni, the first ‘live exhibtion’, BMW Tate Live 10 days 6 Nights in the Tate Modern Tanks in 2017, featuring the work of Fujiko Nakaya and Isabel Lewis, amongst others. Wood is currently working on the next edition that concentrates on Joan Jonas, as well as the Hyundai Turbine Hall Commission for 2018, and is due to publish her book Performance in Contemporary Art with Tate Publishing in 2018. Donna Lynas has been Director of Wysing Arts Centre since 2005 and has developed Wysing's identity as a research centre for the visual arts; introducing experimental artists' residencies and retreats and commissioning and curating ambitious projects including the annual festival of art and music. Donna was instrumental in delivering Wysing’s RIBA award-winning capital development project which opened in 2008 and now offers a unique set of facilities including purpose-built artists' studios. Donna is Chair of the Contemporary Visual Arts Network in the East and plays an active role on the steering committee of the Plus Tate network of Directors. Previously, Donna was Curator at South London Gallery (1999-2005) where she established the gallery’s influential performance and off-site programmes and worked with artists including Christian Boltanski, On Kawara, Joelle Tuerlinckx and Keith Tyson on their solo exhibitions, alongside curating a number of group exhibitions. Prior to that, Donna was Curator (1997-99) and Touring Exhibitions Organiser (1995-1997) at Modern Art Oxford. She studied Design at Duncan of Jordanstone College of Art, Dundee.